A misaligned jaw can cause numerous problems in the rest of the body, including facial tenderness, headaches, and hearing problems. TMJ (temporomandibular joint) disorders are concerns of the jaw caused by grinding and clenching of the teeth, stress, and other strain or damage to the joints that connect the jaw to the skull. In such cases, Dr. Campbell and Dr. Schmidt offer a variety of treatment options to help patients achieve optimal comfort and function of the TMJ. 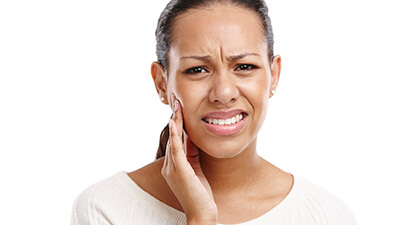 If patients experience any combination of these symptoms, we carefully examine the jaw, the way the bite fits together, and other structural indicators of TMD to determine the diagnosis. 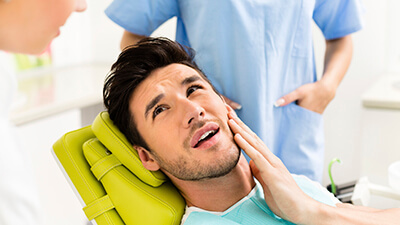 If patients are diagnosed with TMD, we may recommend a number of treatments including occlusal adjustment, oral appliance therapy, and TENS treatment. Ensuring the ideal overall form and function of patients’ jaw joints, bite, and overall motion, is essential for the complete form and function of patients’ smiles. Often referred to as equilibration, adjustment of the bite, allows patients to achieve their optimal jaw function free from pain. We may recommend a number of treatments to complete equilibration, including braces, retainers, surgical treatment, and other adjustment methods. Our team works one on one with patients to determine which treatment option is best to achieve their desired results. Patients whose TMD is a result of nighttime teeth grinding and clenching may benefit from wearing an occlusal splint. These comfortable, custom mouthguards position the jaw in its ideal location, allowing the joints to rest comfortable while patients sleep. This significantly reduces the amount of grinding and clenching patients experience during sleep as the jaw joint seeks a comfortable position. The relief of this undo strain at night is often adequate to significantly reduce jaw pain and discomfort. Transcutaneous Electrical Nerve Stimulation or TENS is a therapy that allows us to use low voltage electricity to reduce unnecessary joint and muscle movement, relieving pain. TENS therapy sends an electrical circuit through the painful area, blocking pain receptors in the brain. This relieves pain and allows patients to resume regular daily jaw motion without strain or discomfort. We provide TENS treatments in our practice, and for those patients with severe TMD, we may recommend the use of TENS at home.